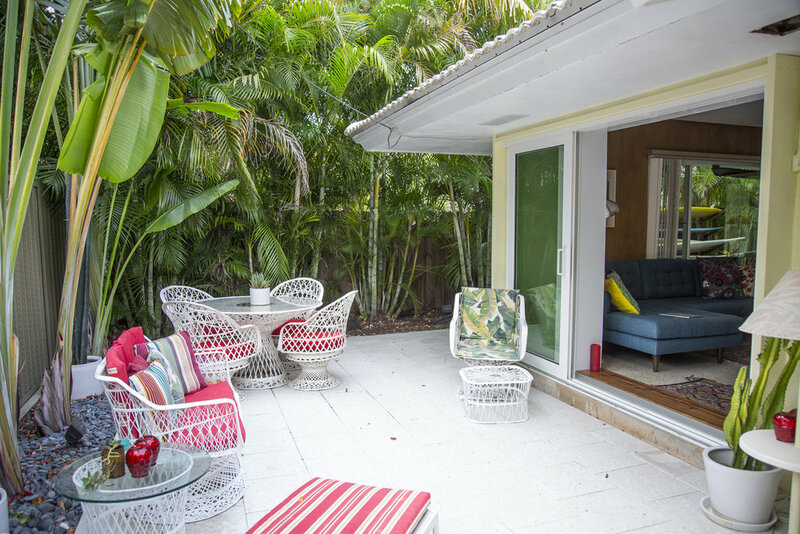 Sarasota Magazine quotes our beach cottage as "fresh and bright with a mid-century vibe that welcomes guests from all over the world and offers a refreshing alternative to the shell and fish decor of so many coastal cottages". That we do! This listing is for the luxury 1 bedroom apartment. 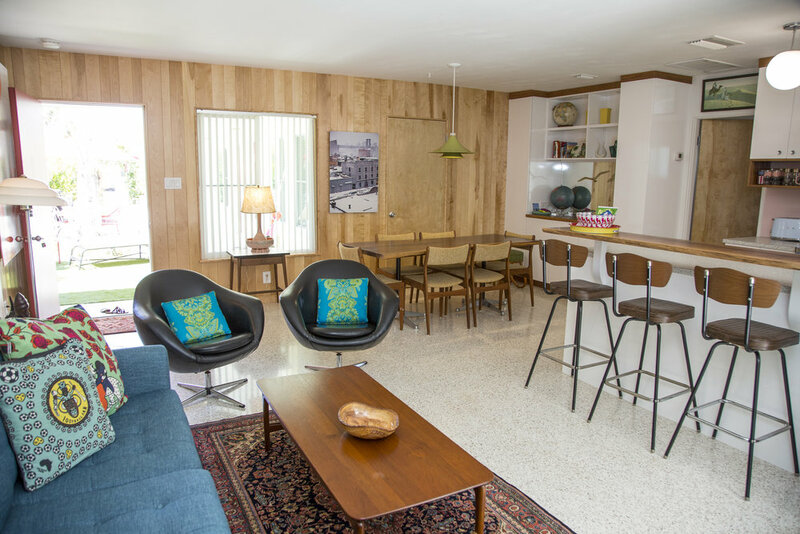 It has high speed internet, 60 in flat screen TV, a brand new high gloss custom kitchen, fully equipped with Big Chill appliances - gas stove, fridge and dishwasher - and many thoughtful touches. We installed lovely sliding doors from the living room out to a private patio with a dining area and nice sofa, chairs and loungers. The bedroom has a custom made king size bed with a brand new top of the line Zenhaven pure talalay latex mattress with fresh crisp sheets. 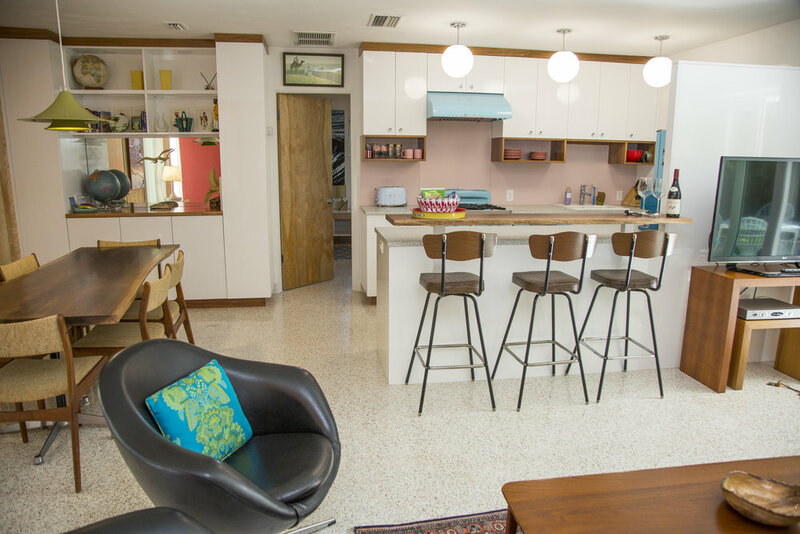 There is a pink tiled bathroom with many original (1960 ) features and smooth terrazzo floors throughout. Lido Beach House is it! Awesome location to beach and really short walk to the circle. Great attention to detail here. Loved it! We like to think of this apartment as our most luxurious. 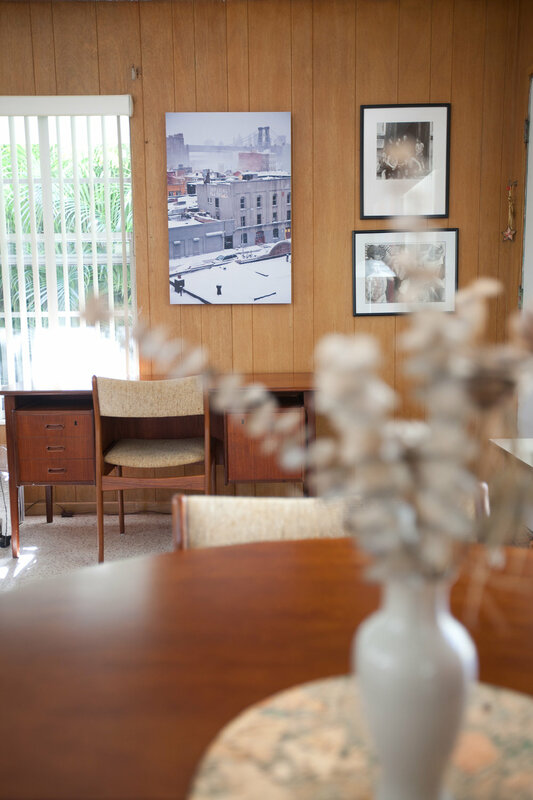 It's a beautiful, cozy yet spacious one bedroom, nestled at the back of the property with it's own private patio. Dale recently built the most stunning white high-gloss kitchen and dining area with accents of Australian pine and a matching Australian pine bar top and 6 foot dining table. 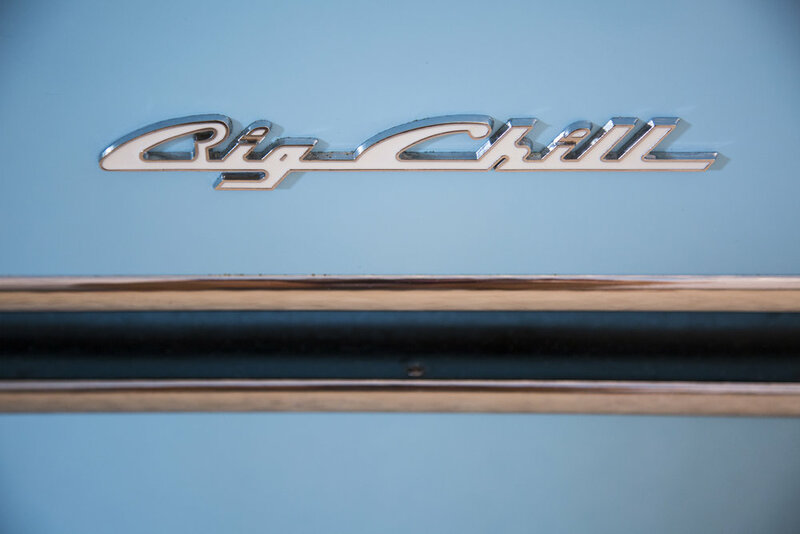 We absolutely love the retro style Big Chill gas oven and stove top, fridge and dishwasher, all in a cool blue color. It makes for easy and fun cooking. 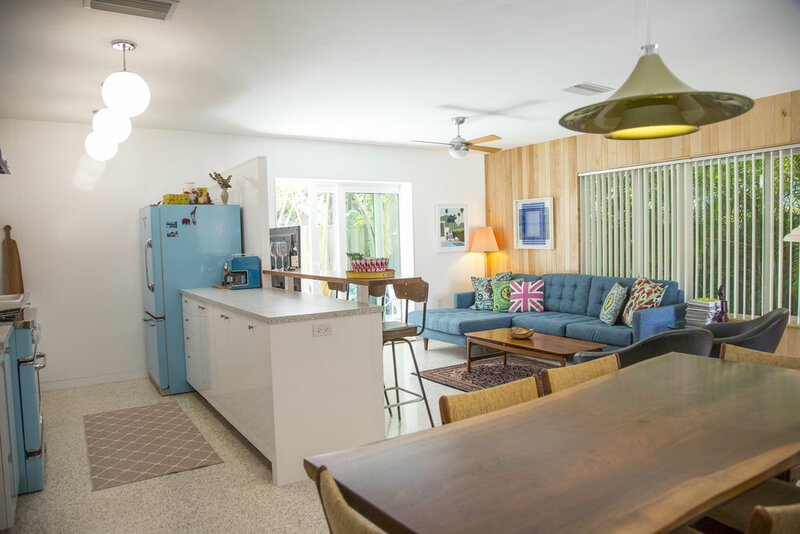 There is also a blue Smeg toaster and a retro microwave for quick snacks. 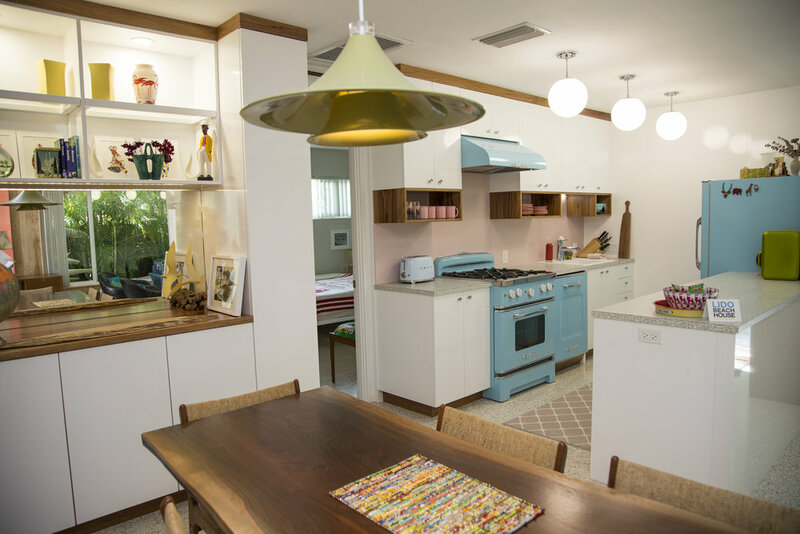 I love the mid-century style globe hanging lights that are on a three way switch and the sweet rose tinted color scheme. The buffet area has tall, spacious storage space and allows for some serious dinner parties! If you need to do some work on the computer, set it up at the Danish desk - Fioz high-speed internet is convenient. The bedroom has a king size white gloss platform bed ( made by Dale of course! ) with the most luxurious of mattresses - the Zenhaven It's made of 100% natural talelay latex and layered with organic breathable New Zealand wool. It's heaven! The cabinets in the bedroom are lovely refinished Heywood Wakefield and there is plenty of room to unpack your belongings. The retro pink tiled bathroom is in it's original state except for a new cabinet ( complete with Paul Mcobb knobs! ) and a new pink toilet. We provide organic bath products, just being your toothbrush! 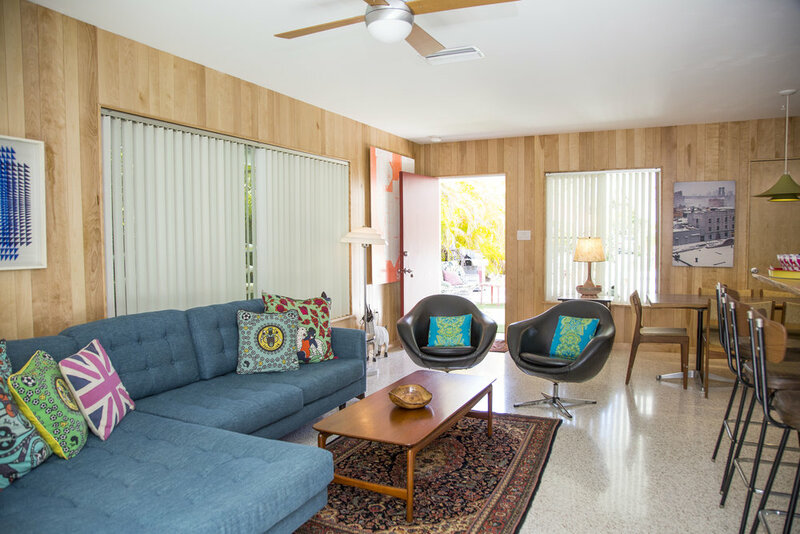 There are cool, buffed terrazzo floors throughout and mid-century style furniture and decor, including a fantastic blue couch to lounge and watch TV from. 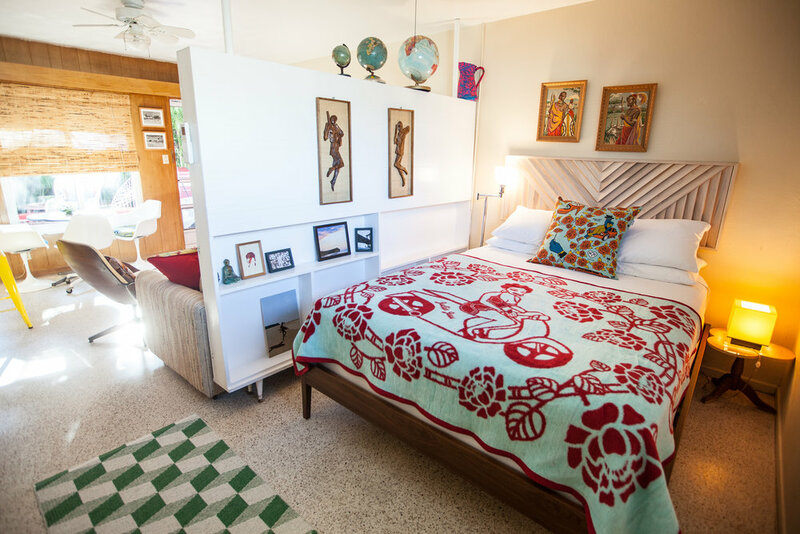 The furniture, if not made by Dale is bought at local mid-century auctions and the art is a mixture of vintage finds and local artists' work. Central air and heat ensure you will always be cozy. This apartment has an interleading door to the studio apartment next door for families or groups of friends. the door is kept locked otherwise. 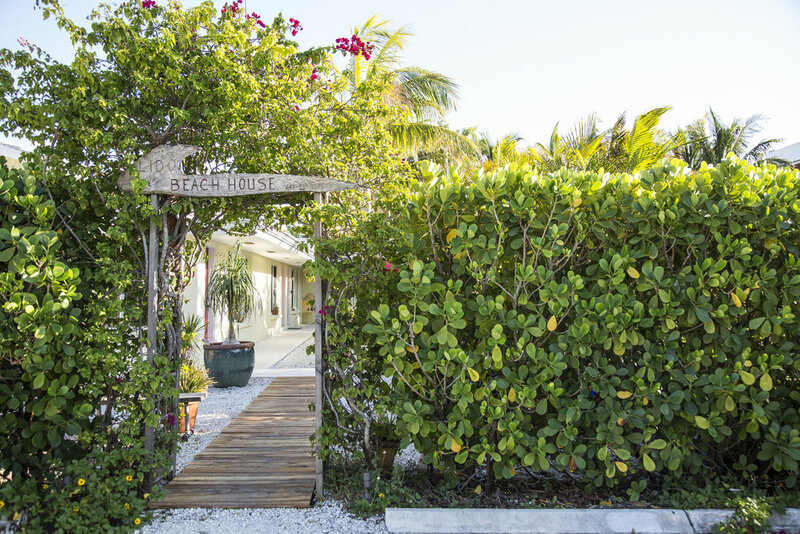 There is parking in front of the house and for guests, parking can be found at the end of the street by the beach or on the street at your own risk. 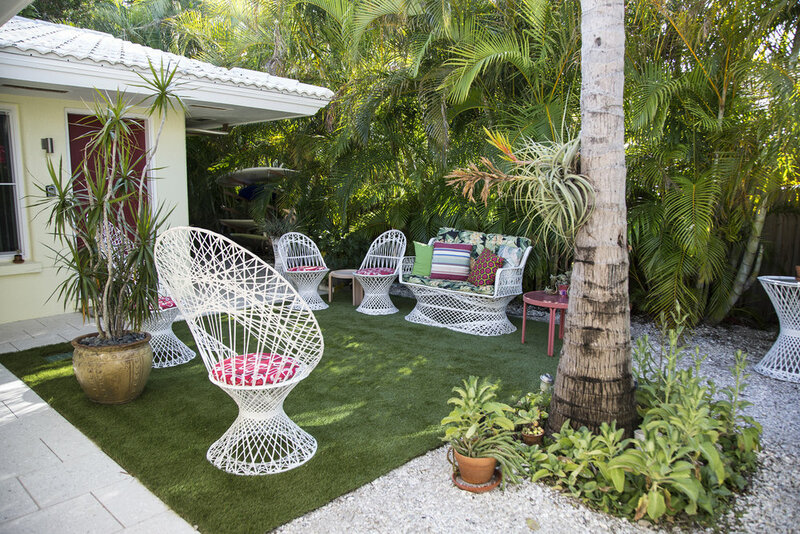 There is a nice outdoor landscaped garden with palm trees, tropical plants, lounge chairs, umbrellas, a shady hammock and different areas to sit and relax. 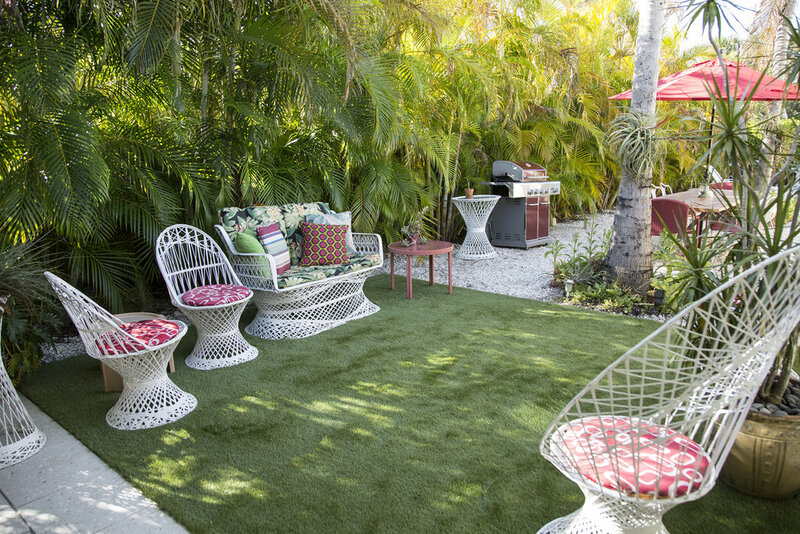 A bbq grill and dining area is available anytime and we offer a washer and dryer free for guests use. We provide bikes ( including a vintage tandem! 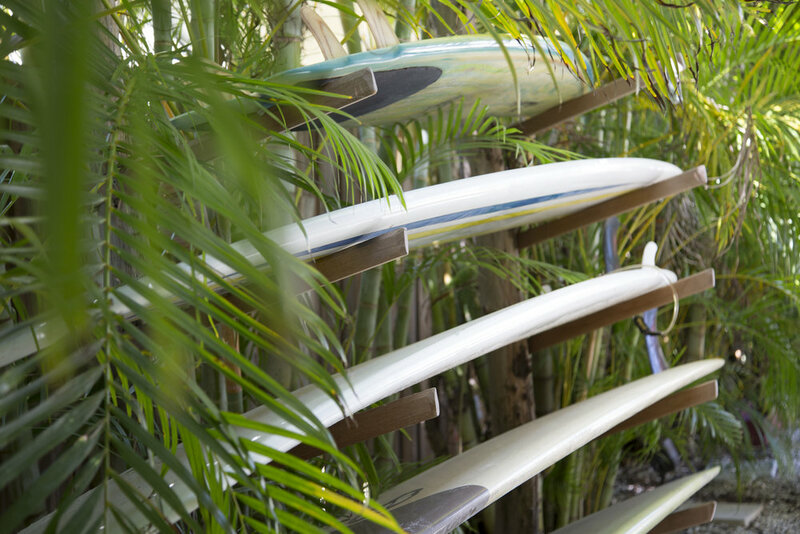 ), surf boards, coolers, beach chairs, umbrellas and many other things for the beach. Gorgeous sunsets are also free! 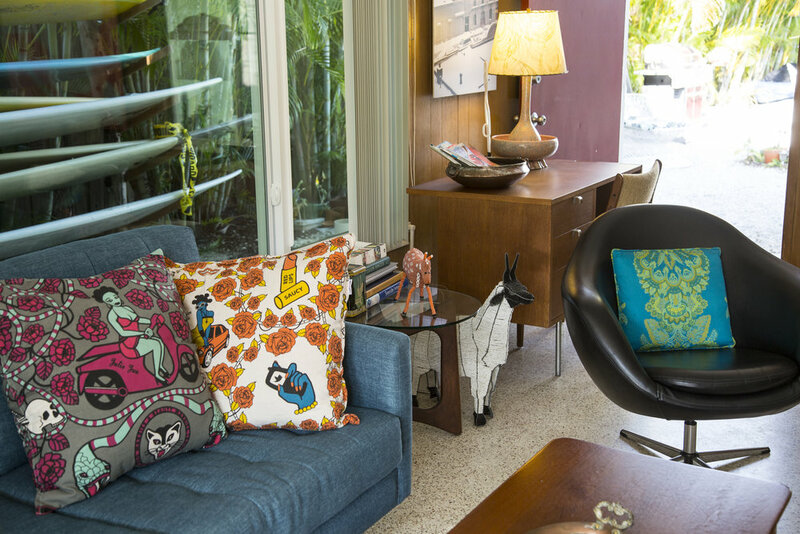 We aim to create a calm and friendly guest house with a "boutique" style, filling the units with lovely furniture and decor and art that we have picked up on our travels. Want to book the whole house? Invite some friends? We have 2 additional apartments! A spacious bright 2 bedroom apartment, this space is perfect for 2 couples or a family of 4 with room for a guest. 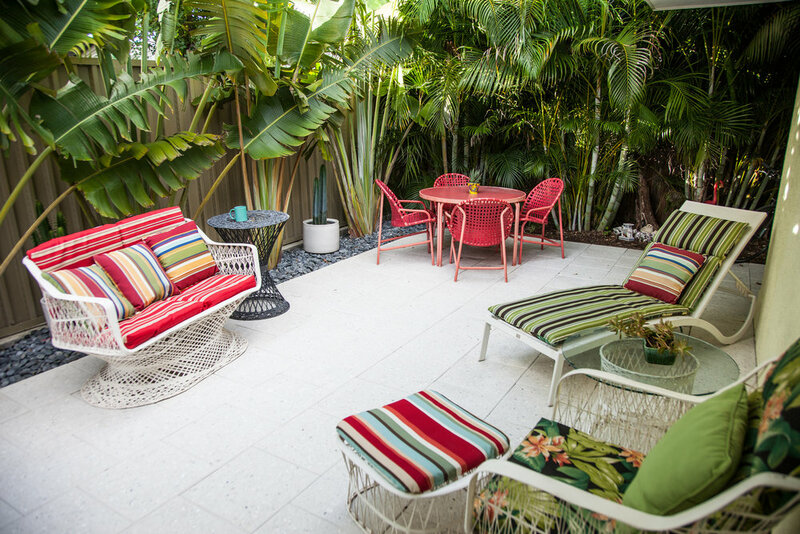 At the front of the house, there is a private patio with a variety of seating and chill-out spots.